I named her Charlotte. She was big, fat and as black and shiny as obsidian. A blood-red ribbon on her belly, distinctive of her species, exclaimed “stay away!” But I couldn’t. Not quite. I was too enthralled. Charlotte was a black widow spider who occupied the space between the stucco and the utilities box on the outside of my duplex apartment in Albuquerque. I had moved into the apartment just months before and was unaware that these eight-legged neighbors would be moving in soon. The first time I saw Charlotte and some of her kin in my yard, I was horrified. The only knowledge I had about black widow spiders was that they packed a powerful bite full of neurotoxins. Most people live to tell the tale, but it’s not a pretty tale—it’s full of 18 hours of spasms, nausea and general discomfort. The bite itself is five times more toxic than that of a rattlesnake. I was terrified, but I couldn’t bring myself to kill Charlotte or any of the other dozens of black widows in my yard. Instead, I kept my distance and went to the Internet. My first search—“black widow bite symptoms”—was, perhaps, a mistake. That night I dreamt of big, shiny black spiders dancing all around me, threatening to inject their venom. One day, I realized that Charlotte was gone and I was a bit sad. She was like an old friend—an old friend that both scared and mesmerized me. A year passed and black widow season arrived once more, only my arachnid army was even more populous than before. Veiled by the darkness of night, widows built messy webs between my screen and wooden doors. On two occasions, I touched these clever web constructionists as I reached for the doorknob to let my dogs out in the morning (I now have a sign on my door that reads “Look for black widows before opening the door”). I found one in my closet, and saw many moseying around my porch after dark. These spiders were getting too comfortable in and around my home—and too close for my comfort—so I engaged in another “web” search (of the Internet kind). This time, I focused on natural spider deterrents. Site after site said that spiders dislike the smell of peppermint, so I bought a bottle of peppermint essential oil and a spray bottle and made a concoction of “natural spider deterrent.” I spray this around the edges of my door religiously, and I believe it has kept the spiders out of my house, although a few still remain in the areas adjacent to my porch. One, which I named Annabelle, lives in my clothes dryer chute. I cannot, for the life of me, figure out how she survives there. Each time I use my dryer it’s somewhat akin to a spider-level hurricane—the powerful force of the outgoing air wrecks her home and she has to rebuild (without the support of volunteers or FEMA). Just like the residents of New Orleans, she determinedly rebuilds, however. The chute is very close to my door, and I always feel a bit nervous at night when I let the dogs out, but she usually crawls up into the chute and hides the moment she feels the human and canid vibrations nearing. Another spider has moved into Charlotte’s old home between the stucco and the utility box. I suppose I’ll call her Charlotte Jr. One day I watched Charlotte Jr. wrap a moth for later consumption. It was a terrifying and fascinating moment and I grew respect for her species. Although each of the spiders looks exactly the same as any one of the millions living in the American West, I fondly compare Charlotte Jr. to her predecessor and will be saddened when she no longer spins her messy web on the side of my house. I’m still somewhat frightened of the black widows living in my yard, but I also have a great respect for their durability and beauty. Not to mention they clean up all the roaches around. Nonetheless, I’ll keep spraying my natural spider deterrent to keep them outside. I’ll beware of walking around outside without shoes and I’ll keep an eye on my two curious dogs. 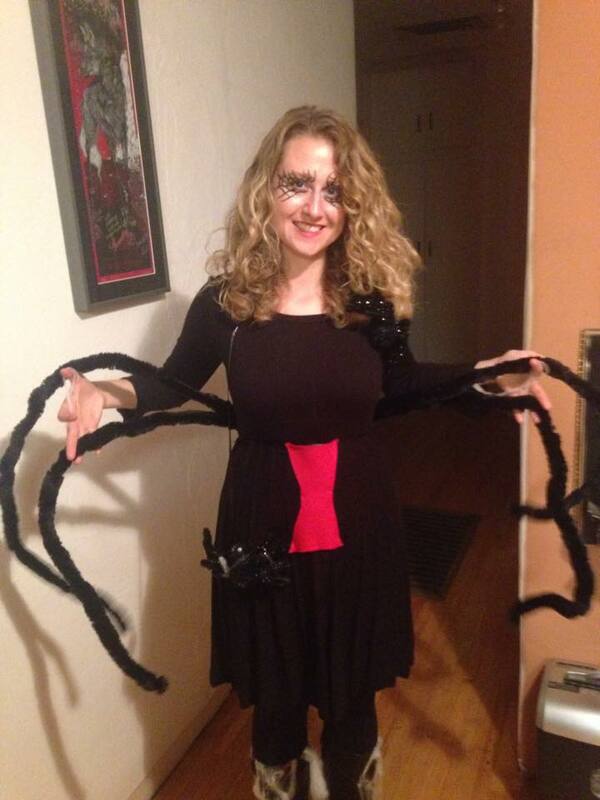 Otherwise, I’ll continue to reign as the queen of the black widows.